Global Adventuress kicks off their Southern African series with a world famous Victoria Falls bungee jump. Chief Explorer of Global Adventuress Patricia Stone takes the Victoria Falls Bungee Challenge! She says, “If you love adventure, this is an adrenaline rush like NO other!” She would know since she has skydived, scuba dived, summited some of the world’s peaks. Global Adventuress was on assignment in Zambia and Zimbabwe, and stopped by Victoria Falls Bungee to sign up for her 1st jump! 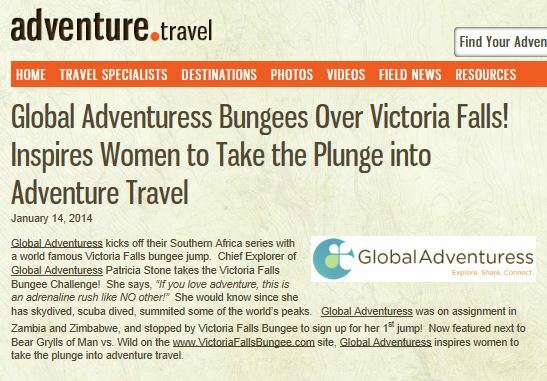 Now featured next to Bear Grylls of Man vs. Wild on the www.VictoriaFallsBungee.com site, Global Adventuress inspires women to take the plunge into adventure travel.